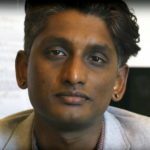 Curtis CordViknesh Silvalingam is a motion picture producer and director, whose first independent film, True Love, which he filmed in his native Singapore, has received some good reviews. For his second film, he chose the topic of olive oil fraud. He joins us today from San Francisco. Viknesh, good morning. Curtis CordHow are you today? Curtis CordI read that while serving as a Combat System Specialist in the Singaporean Navy, you spent any free time you had writing scripts for short films. What made you want to be a filmmaker? Viknesh SilvalingamWell, I always had an interest in filmmaking, and I mean storytelling is the most important thing that I like to do. Back in school, I used to write essays. Somehow I got involved in being in the Navy. While being in the Navy I still kept in touch with my creative aspects. I kept on writing short stories and then I discovered film as a medium. Then I decided, you know what, I should be a filmmaker too, I think it seems to be one of the cool things to do. Curtis CordWhen did you move to the United States? Curtis CordHow old were you at that time? Viknesh SilvalingamI was 27. Yeah, 27 year. Once I left the Navy, my contract ended with the Navy and then I came to California to pursue a film education. Prior to that, I had no film education at all. Curtis CordDid you come with the rest of your family? Viknesh SilvalingamYeah, me and my wife, the two of us. Yeah. Curtis CordWhen you got to San Francisco, what did you do when you arrived? You went to school? Curtis CordTell us about your first film, True Love. Viknesh SilvalingamWell, True Love was a very low-budget film. It’s like so minute in terms of budget-wise. Why I really wanted to do that film is because I’ve been writing. In fact, I’d been writing True Love from a different version since 2002, 2003. It started as a short film. Then I started writing more and more. Then it became a feature-length film. I wanted to make my first film to be shot in Singapore, and if you know about Singapore, Singapore is a multi-racial country. We have Indians, Chinese, Malays. I wanted to focus more on the Indians in Singapore, but instead of making it like a cultural movie, I wanted to make it a crime movie with Indian characters in it. It just showed the different perspective on how … Because people react differently. Different people react differently. I wanted to show that an Indian character in a very mainstream scenario will react differently to things. Curtis CordWhen did you make that? Viknesh SilvalingamI shot that in 2010. I was still in film school then. I got a couple of my film school buddies from here, we flew to Singapore and then we shot it over there over the summer. It was like a 15-day shoot. It did well. It’s now available on Amazon streaming. You can get the DVD as well. It got selected for a film festival in New York. Curtis CordWhat is the length of it? Curtis CordMm-hmm (affirmative). Cold Pressed is billed as a crime thriller, a story about an olive oil counterfeiter who wants to build a business empire by selling adulterated olive oil in the United States. What inspired you to choose this topic for your second film? Viknesh SilvalingamWell, it’s a funny story. When I first came to California, I found that my diet changed a little bit. Back in Singapore we used to always eat oily food. We used to fry with corn oil and everything. When I came here, I was living by myself, me and my wife, so we didn’t have our parents cooking, so we decided to change our diet a little bit. We thought that using olive oil. I know that it could be the quality of the olives too, but even the look of the oil is different. The one I buy from the small, neighborhood store is very light. The one from Trader Joe’s or wherever sometimes it’s a little bit darker. Then I started doing some research on it and I found out that people actually mix it up with corn oil or soybean oil and sell it as extra virgin olive oil. Viknesh SilvalingamThen, I was like, “Wow.” Then I found out how the gangsters in Italy, I mean, it’s not just gangsters, it’s more like dishonest businessmen. That’s what I would say. I wouldn’t be like they’re trying to make a profit out of it and they’re trying to maximize their profit. It’s unfair, and it’s not even olive oil, even black pepper, even chicken. Food is such a very cross-cultural, and very … It’s essential for all of us to survive, and, people are trying to cheat us over that is something that everyone should be aware of. I felt that I could do a documentary about it. To be honest, a documentary about olive oil, it would only interest the people who are already interested about olive oil, you know what I mean? If I could to do a crime movie, and then somehow slip in the message about there is such a thing as fake olive oil, then maybe I could get the message across wider. Curtis CordYou notice the difference in the oils at Safeway and at perhaps at the other stores, you started to become concerned about fraud, food fraud. How did you go about researching for the film? Viknesh SilvalingamI did a lot of online research. Mostly online and on YouTube there’s like a bunch of videos about it, as well. Then I come in … Funny thing, so I started writing the screenplay before coming across Extra Virginity, a book by Tom Mueller. Yeah, so it was like, “Wow, this actually, whenever I’m writing about, it actually makes sense because it is true, people actually … there’s a lot of underbelly to this olive oil industry that people need to be aware of.” My research helps a lot. This 100% extra virgin olive oil will soon, very soon, be distributed throughout the West Coast, and the entire country. Curtis CordIn the film, exactly how are the criminals adulterating olive oil? Viknesh SilvalingamWhat they do is they bring in the oil from Italy. They bring in a few barrels from Italy and then they bring it down to California and then they cut it with soybean oil and corn oil. Instead of having eight or nine cases of olive oil to sell, they ended up having 30 or 50. It just multiplies their output by mixing it with other oils. Curtis CordIs that kind of activity widespread in your opinion? Viknesh SilvalingamYes. Yes, I think it is. The funny thing is I did … The Bay Area, there’s quite a number of olive oil producers, distributors. I spoke with them too, and then they were telling me, yeah, they were saying that it’s pretty rampant. One of them told me that because olive oil, they divide it into A, B, or C grades. The A grade is the one that is the most purest, and B is not so pure, in terms of quality of the olive. This girl is telling me that the B grade ends up costing more than the A grade because people do not know the difference between good oil and bad oil because their tongue has been so immune to it. Curtis CordA, B, and C? Curtis CordYou mean the grade of the oil? Curtis CordI see. You started a crowdfunding campaign to raise the funds for post-production, but it looks like you fell short of your goal, which was to raise $35,000. It looks like you raised about $8,000. What’s the current status of the film? It it going to get made? Viknesh SilvalingamYes, it is. That’s a bummer that I didn’t get enough fundings to do it the way I wanted it to do. Yeah, but right now it is in post-production. It should be done by end of this year, that’s my goal, and be on track with it. What actually happened instead of going to a major studio to do the final post, and everything, we ended up going with freelancers, which is the same exact, but it just takes time. Curtis CordHow happy are you with the raw footage? Viknesh SilvalingamOh, it’s great. I think my whole team did a great job with the limited resources that we had and I think they will be proud of it. I think everyone watching it will be proud of it. I’m proud of this film too. I think it’s one of my best ones. Curtis CordI noticed in the crowdfunding campaign you offered several packages, or perks as they’re called, to those people who contributed to the crowdfunding drive. The titles of those perks were as follows: The $10 perk was, Star Olive Oil; The $20 perk was Carapelli Olive Oil; the $40 was Newman Olive Oil; $75 was Colavita Olive Oil, and the $200 perk was Pompeian Olive Oil. Why did you choose those titles? Viknesh SilvalingamOh, wow. Well, I mean, those are the oils that are very common in grocery stores, so people usually see those brands in the market. The reason why I put those brands is, we live in a time where we, whenever we buy a product, we just don’t want to buy that product, we are actually going to find out who the manufacturers are and what they do with their social time. I mean, how they contribute to society as well. You know what I mean? I just want, this film is people whenever they buy a bottle of olive oil, they actually find out who the farmers are and how they grow their olives. This is something that we put into our body, so we need to be very aware about it. Curtis CordBut, you’re not actually sending the people who contribute those amounts, you’re not actually sending them the olive oil? Viknesh SilvalingamNo, no. It was just the name of the program. Curtis CordIt was just a symbolic title of that package. You’re clearly trying to send a message with those titles. Curtis CordAnd, that message is? Viknesh SilvalingamThe message is find out more about these olives before you buy them. Curtis CordMm-hmm (affirmative). I watched the brief interviews with the cast of the film that were used to solicit the contributions. Each of them stressed that one of the objectives of the project was to education people on the problem of food fraud and olive oil adulteration. One cast member said it was a matter of life and death. Another said his wife had food allergies. After watching the film, what do you think the audience will gain in terms of their understanding of olive oil? Viknesh SilvalingamWell, after watching the film, I just want them to know that there is such a thing as adulterated olive oil and even the minor producers to the major producers are doing it, and they should find out more about their food before they buy it. Hopefully, they will put this kind of cheating businesses out of business. Curtis CordHmm. You’re really talking about olive oil adulteration, which is different from the mislabeling of extra virgin, for example, when it’s really a lower grade. You’re not talking about substandard olive oils. You’re talking about adulterated olive oils in the film, isn’t that true? Viknesh SilvalingamYeah, it’s like some bottles of olives where they actually say that it’s the blend. They say it’s like an olive oil blend, which is the everything that is not taken from one source of olive oil. But, there are some brands that claim blatantly that they are extra-virgin 100% Italian olive oil, but in actual fact the oil could be coming in from a variety of countries. Curtis CordWhat kind of interest has the film generated? I’m curious about, since you began this project, have you gotten calls, for example, from any stakeholders in the olive oil industry? Viknesh SilvalingamI got a couple of people calling me asking me about my film. Some of them, they are very self-conscious. They don’t want my film to putting the industry in a bad light. I had to reassure them that that’s not my intention. My intention is to make it aware. I’m sure they, themselves are aware that there is such a thing as fake olive oil, but they can’t go around telling people that, because that is their business. That is the industry, right? They need an outsider to tell the rest of the world that there is such thing as food fraud or adulterated olive oil. Yeah, a couple of people call me, they are very concerned about it and some of them, they were very happy that I’m bringing this out in a more entertaining way, rather than doing a documentary about it. Curtis CordThe calls where they were concerned about how you’re portraying the industry, how would you characterize those callers? Viknesh SilvalingamI mean, they are all small businesses. I understand why they are concerned about it. They are honest people, that’s what I will say, they are just very concerned about how we portray because they might ask me, what gave me the right to make a movie about olive oil, because I have no connection to olive oil at all. Viknesh SilvalingamMm-hmm (affirmative) true. Exactly. Curtis CordThat’s what it’s called. What’s the next step now? What are you going to do now? What are your plans for the film? Viknesh SilvalingamI’m planning to send it to a few festivals, one from Dunedin, so the whole of 2017 will be making it’s rounds to the festival circuit. Then eventually, I hope it gets picked up by a distributor and everyone will be able to see it on streaming VOD. Curtis CordAgain, you said that will be some time before the end of the year? Viknesh SilvalingamYes, end of this year, so now it’s November. By next month, yeah, the middle of next month. Before Christmas. That’s what I gave myself the goal to finish it and we are on track. Before the end, before Christmas, the movie will be done and next year it should be playing in some festivals, I hope. Curtis CordHow much does it cost to put a film of 90 minutes into post-production? Viknesh SilvalingamIt varies, depending on what I want to do. I had a good team. We managed to find creative solution to problems. The reason why I wanted $35,000 was to go to a major studio to do it there, and if there are any problems with the images or the audio we could fix it by doing ADR, or something like that. But, since we didn’t hit our goal, all the fixes that we had to do we had to find creative solutions to it. Editorially as well. In a way, it’s good, because with mistakes you find out new way to do things. It’s just what we do. Abundance is the dearth of creativity. Curtis CordNow that you and your wife are concern about the quality of the olive oil, you’re still enjoying olive oil in your diet? Is that true? Curtis CordNow that you’re concerned about the quality, how do you go about choosing a bottle of olive oil? Viknesh SilvalingamWell, most of the olive oil, they will have a seal by the COOC, the California Olive Oil Council. That is one of my go-to methods to see if the oil is pure or not. Then, once I do that, and then I’ll find out a little bit more about the olive oil myself and then once the coast is clear, I’ll just keep on buying the same oil over and over again. Curtis CordWhat about tasting it? Do you think you could taste the difference between an olive oil that is truly extra virgin and one that, for example, has been adulterated. Viknesh SilvalingamYes, now I can taste the difference a little. A little bit. Yeah, I think with time, it’s like wine, once you keep on tasting it, you can tell the difference. Curtis CordWhat do you look for in the taste? Viknesh SilvalingamI look for … It gives me like a, they call it a strong taste to it. I mean, the smell is a give-away. The pure extra virgin olive oil is very strong. It smells very thick. Curtis CordYou said it smells really what? Viknesh SilvalingamYeah. And when you taste the oil, it leaves a little bit of like … oh, wow what’s the word, spice, spicy to me a little bit. Viknesh SilvalingamCan I say spicy? Viknesh SilvalingamIt lingers, yeah, it lingers in your mouth. Even after swallowing it, the taste of the olives still lingers in your mouth a little bit for a few seconds. Curtis CordWhen it’s bad, what does it seem like? Viknesh SilvalingamYeah, you taste nothing. The bad ones that I’ve tasted, they are like very light. I think that’s why people when they buy a bottle of olive oil, they look for the light quality in it, because they can’t handle the taste of pure, extra virgin olive oil because the pure oil is very intense. It tastes pretty intense. People buy diluted olive oil thinking that’s the good stuff because it feels light. Viknesh SilvalingamYes. Exactly. Then since it’s light and diluted, it automatically becomes a healthier choice. Curtis CordWhat’s your next project? Viknesh SilvalingamWell, I do have a couple of projects lined up. Curtis CordI guess you want to finish this one first, right Viknesh? Viknesh SilvalingamYeah, I can’t wait to finish this film. It’s been like four years of my life. I started developing when my wife was expecting. Now, my son is turning four in March. Four years of my life in this film. Yeah. I’m developing another project. It’s based off this book by this Singaporean author, coincidentally, she wrote about soy sauce. Yeah, soy sauce. Yeah, it just so happens that … But, it’s nothing about fake soy sauce. It’s the coming of age story about this woman who lives in San Francisco. She had to move back to Singapore to help our her parents in their soy sauce business. Curtis CordDo you think your next project will be centered on food, as well? Viknesh SilvalingamThe way things are going, yes, it is. Food is the one that brings people together, so why not? Curtis CordIndeed. How do you make money off a film like this? Viknesh SilvalingamOh, I have no idea. Well, I have no idea. Movies, I mean, the investors who invest in this movie, they just wanted me to finish it and get the message out in the public. I don’t want them to stop investing in movies, so my objective as the producer in this was to make sure that I recoup all of the investments at least. Curtis CordHow would you do that? Viknesh SilvalingamDistribution to VOD sales. Curtis CordRight, Video On Demand? Viknesh SilvalingamYeah, Video On Demand, right. Either like Amazon, Netflix, or iTunes. That’s the only way. Theaters are tough. Everyone knows nowadays people rather watch in the comfort of their home. My movie could do well in limited screenings, but ultimately, on Video On Demand is the place that it will eventually live. Curtis CordWho are your investors? Viknesh SilvalingamThere’s some private investors. Curtis CordAre they particularly interested in olive oil? Viknesh SilvalingamSome were. A couple of them were. Some of them, they were just interested in investing in my films. They like what I’m doing so they invested in me. Curtis CordAre any of your investors involved in the business of olive oil at all? Viknesh SilvalingamActually, but, the olive oil area, like there’s a couple of distributors in California, they helped us with locations, they allowed us to shoot in their premises. Curtis CordYou mind sharing who they are? Viknesh SilvalingamYeah, I don’t think there’s anything wrong with that. That’s The Olivina, and there’s Veronica Foods. Those two are the main contributors in terms of location, and support in terms of technical support for the film. I’m very grateful for their assistance because without that, I wouldn’t have any idea how to capture the real essence of the olive oil. Curtis CordViknesh Silvalingam is a motion picture producer and director, who’s current project, Cold Pressed, about olive oil adulteration, a crime thriller, is currently in post-production. It is expected to be released later this year. Viknesh, it was a real pleasure speaking with you. Thank you very much for our time today.